MH Travel organizes Ada Bojana Beach tour, a tour of the most relaxing and most beautiful beach on Montenegrin coast. This is the top-notch place, with the amazing atmosphere, from DJ parties, numerous water sport activites, tones of restaurants on River Bojana with excellent fish dishes up to the FKK beach "frei-körper-kultur" (free body culture), the best and the biggest nudist beach in Montenegro. We cannot describe in one sentence what kind of paradise is Ada, so look carefully at our itinerary, video and description of the tour and book the ticket to go there. You will be astonished that some part of Montenegro, which is so close to other cities on Montenegrin coast can be so different, so unique and looks like you're staying in another country even continent. But this is Montenegro, the smallest country with the biggest natural diversity in the world.Finding this place from Kotor and Budva is not easy by public buses and that could take a lot of your time. There is no public bus from Ulcinj to Ada Bojana, so taxi is necessary, and the distance is 12 km. Paying public bus service and taxi costs more than our tour ticket, so we offer a really good price for this tour. Thanks Bojana as natural river border between Ada and Grand beach, Ada become a perfect place for nudism. Ada was the most popular nudist resort in ex-Yugoslavia especially among German tourists. There are two tourist objects on Ada Bojana: bungalow apartments and an auto camp. Entrance fee for Ada Bojana island is 2 euro per person. We will not go straight to the FKK part of the beach. We will go to the the river mouth into the sea. Only on that part of the beach guests can wear the clothes or swimming suits.This part of the beach is 300 meters long. After that part is the sign that guest can go on FKK beach ( free of charge) but they should be naked. That beach is 1880 meters long. Guest can find a lot of free space and enjoy in their privacy. If some of the guests want to go on FKK beach, and enjoy of the free body culture, this is possible. Guests who don't want to go on FKK beach, can stay on well equipped public beach with a several bars and restaurants. This place is also fantastic base for the all type of water activity like kite surfing, paddle boarding, kayaking, waters skiing and jet ski. Kitesurfing is probably the best on Adriatic here on Ada Bojana and Grand beach. 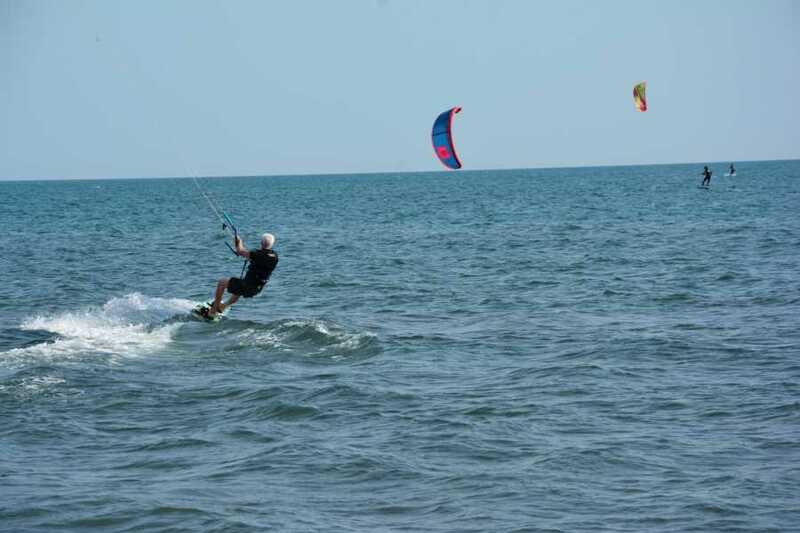 There are several kitesurfing clubs on Grand Beach and Ada Bojana. There is Ada's international kitesurf club and camp. Guests who know how to use kitesurfing can rent the kite and enjoy in surfing, but guests who don't know how to use it can take a lessons of kitesurfing or enjoy in some other water activity or just lay down on the warm sandy beach and sunbath. Restaurants next to the beach are excellent. Also, guests can swim in the river water and in the sea water. Houses on the river make "Thai" and bohemian atmosphere. DJ parties are all the time in some bars, but Ada and Grand beach are so long and wide that anyone who goes there can find a peaceful place. The sea bottom is not deep, and its around knees in a distance from 50 to 100 meters from the beach. It makes beach paradise for kids as well as the guests who don't like to swim in the deep sea. Montenegro coast doesn't have sharks or any dangerous fish close to the beach, so swimming is perfectly safe. Only thing that guests should pay attention is sea curves that can be strong and the ways that can be big sometimes when the swimming is not possible. Our stay on Ada Bojana beach finishes at 15:00, maximum 15:30 when we need to go back to Budva and Kotor before the biggest evening traffic jam. NOTE: Entrance fee for Ada Bojana Beach of 2 euros is not included in the price. Breakfast and lunch are not included in the price. In total, all tickets, breakfast, lunch and snack will cost you 15-20 euros. But if you want you can bring your own food and drink. Tour is organized by air conditioned car, mini van or mini bus.